Not sure if this is intended or not, but at a certain Y level, the fog effect from rain or desert sand will abruptly shut off. Is there any way to fix this, or a way to make the transition less harsh? Not sure if this affects any other weather effects. What mods are you using in your pack? I have found fog to be a pain in Minecraft. It's on my list of things to rework to see if I can get fog to behave more appropriately. I am reworking the fog feature of the mod. Should have something to look at in the next BETA drop. Any idea what happened that i get gravel sound everywhere on my server? i have to idea whats going on?! Are there any external configuration files for Dynamic Surroundings in your config? Also which version of the mod are we talking about? EDIT: If Botania is in the pack could this be applicable? Do you know if DS has conflicts with Ambient Sounds? I know that you can control AS config through the DS config so I use the AS biome sounds instead of the DS ones..however, sometimes my laptop lags when running more than 40 mods at a time because it's old. When it lags and my fps drops to 0 for about 5 seconds AS will cut off completely and all biome sounds will mute. The DS sound effects still work.. I'm not sure if you would be able to tell me the answer to that or not. I've tried contacting the Author of AS as well but haven't heard back from them yet. I don't think there are any conflicts over and beyond the potential chance of having multiple sounds playing for a biome. Nothing that should cause a crash and what not. EDIT: Looked at the source and didn't see anything that would stand out being a problem RE: not playing. I'm running both DS and AmbientSounds... had intended to try to sort out which sounds are coming from which mod... but haven't done that yet. Probably don't need AmbientSounds w/ DS doing such a good job. And, of course, DS doesn't stop w/ sounds.... also visuals and other environmental effects. I haven't heard or seen any conflicts between the two mods, but need to sort it out. Will probably dump AS. Just checked my mods folder... I'd already removed AmbientSounds. Haven't missed it apparently. @gmalone if you go to DS config in the mod HUD you can completely config both DS sounds, AS sounds and vanilla minecraft sounds. @orecruncher thank you for looking!! Everytime I hear that mosquito buzzing around my ear, I want to swat it. Thumbs up! Thanks for continuing to update the 1.7 version. The nothern lights display them bad when a BloodMoon occurs from the mod of the same name, they display all black. Moreover the shaders have a lot of issues to display correctly nothern lights, maybe you should make them friendlier with shaders. From what I can tell its not a matter of how friendly Dynamic Surroundings is "friendly" of shaders. It has to do with how a shader pack renders the world. 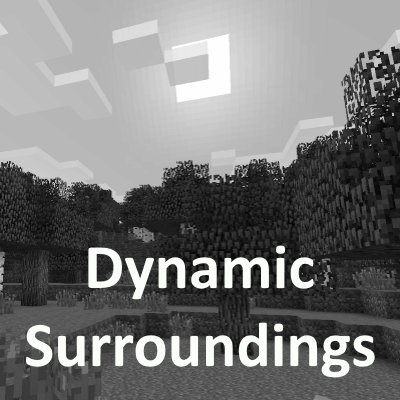 For example, the built-in shaders of OptiFine work fine with the auroras, whereas some of the more extensive shader packs want to own the world and stomps all over what Dynamic Surroundings is trying to do. EDIT: Also look at how name tags are rendered above mob's head. Advanced shader packs don't do this very well. Oh yeah I understand, and it's right it's annoying that shaders stomps on all modded effects and particles. If I walk on a EnderIO cable (conduit), the game crash. Are you aware of that?